Global warming is happening now, bringing changes to our climate and our world. Yet the climate is changing at an accelerated pace in the Arctic region. In the past few decades, temperatures in the Arctic have risen at nearly twice the rate as in the rest of the world, disrupting the region and its people in many ways. A new overview report of the Arctic Climate Impact Assessment, Impacts of a Warming Arctic, explores these impacts in depth. The Arctic region has long fascinated humankind, sparking holiday myths, motivating explorers, and inspiring people to create clever solutions for living in extreme cold. Yet Arctic dwellers from Alaska to Siberia have noticed, within their lifetimes, significant changes in local climate. Scientists have now quantified these trends: climate change is already occurring in the Arctic, and happening at an accelerating pace. Mounting evidence of climate change in the region motivated international organizations to call for a four-year study of Arctic climate known as the Arctic Climate Impact Assessment (ACIA). The Arctic Council, an intergovernmental forum with eight Arctic country members and six Indigenous Peoples organizations, and the International Arctic Science Committee (IASC) representing 18 national academies of science released its report Impacts of a Warming Arctic in November 2004. The report establishes evidence of rapid climate change in the Arctic over the last half century and projects much larger changes ahead. Global climate models use emissions scenarios based on the anticipated greenhouse gas emissions from factors such as economic growth and energy consumption to project future climate outcomes. The Arctic Climate Impact Assessment researchers selected the mid-range emissions scenario used by the 2001 Intergovernmental Panel on Climate Change (IPCC). For a springtime diversion, one Arctic community wages bets on the exact timing of river ice breakup; the winners have picked on earlier dates in recent years. Today's icebreakers transit the Northwest Passage with relative ease compared to the 19th century explorers. The overwhelming volume of scientific data in the ACIA report presents unmistakable trends that amplify this anecdotal evidence. Temperature: Mean annual surface air temperature over the past 50 years has increased 3.6 to 5.4°F in Alaska and Siberia and decreased by 1.8°F over southern Greenland. Sea ice: Sea ice extent in late summer decreased 15 to 20% over the past 30 years (see above). Glaciers: Between 1961 and 1998, North American glaciers lost about 108 cubic miles of ice—about equivalent to spreading one foot of water over California, Arizona, Nevada, Utah, and Colorado. Vegetation: White spruce, the most valuable timber species of the North American boreal forest, experienced sharp declines as summer temperatures frequently exceeded the tree's critical threshold temperature. Marine Animals: Almost no seal pups, dependent on sea ice, survived in Canada's Gulf of St. Lawrence during the ice-free years of 1967, 1981, 2000, 2001, and 2002. Fisheries: Warming in the Bering Sea after 1977 has increased the herring, Pacific cod, skates, and flatfish species, and Pacific salmon commercial catches have been high since 1980. Indigenous Culture: Peary caribou populations on Canadian arctic islands plummeted from 26,000 in 1961 to 1000 by 1997, affecting people whose culture is intertwined with caribou. Climate shifts detected in the Arctic serve as an early warning for global climate impacts. Listed below are a few of the projected changes based on a mid-range emissions scenario. Temperature: Mean annual surface air temperature over the Arctic region (north of 60° latitude) is projected to increase 3.6°F by 2050 and 8°F by 2100. Sea ice: Summer average sea ice extent is projected to dramatically decrease by at least 50% by 2100. Glaciers: Surface air temperatures are projected to warm enough in this century to initiate long-term melting of the Greenland ice sheet. Vegetation: Forests will expand northward into the current tundra regions. Although forest growth increases carbon dioxide uptake, this beneficial effect will be overwhelmed by the release of large stores of methane and carbon dioxide as tundra regions thaw. The increased absorption of solar radiation by forests, compared to the more reflective tundra they will replace, will also lead to net warming. Marine Animals: Ringed seals are entirely dependent on sea-ice for their survival and will be the most vulnerable to reduced sea-ice projections. Polar bears are also dependent on sea ice and their preferred diet is almost exclusively Ringed seal. If there is almost complete loss of summer sea-ice polar bears may not survive as a species. Fisheries: Warming may improve fish stocks of cod and herring but threaten cold water stocks such as northern shrimp. Indigenous Culture: Caribou and reindeer depend on tundra vegetation, and will be affected as projected vegetation zones shift northward and the tundra area diminishes significantly. The shifts in terrestrial and in particular marine species dependent on sea ice threaten traditional food sources for indigenous people. Navigation: The Northern Sea Route navigation season is likely to increase from the current 20 to 30 days per year to almost 100 days per year by 2080. Ozone: Arctic climate shifts are expected to delay recovery of the northern stratospheric ozone layer. One of the ways a warming Arctic could directly impact the rest of the world is by raising global sea level. The place at which the sea surface intersects with the land depends on many factors such as tides, local atmospheric effects such as storm surges, sinking or uplifting of a land region, the temperature and salinity of ocean layers, and how much of the world's water supply is stored on land in lakes, groundwater, snow, and ice. Polar regions currently store vast amounts of water on land as frozen ice sheets and glaciers. Fully 3.1 million cubic kilometers of ice is contained in the Arctic glaciers—roughly equivalent to 1.3 times the volume of seawater in the Gulf of Mexico. Scientists are working to better quantify, through measurements and models, the rate at which this ice will melt and be released to the ocean. The ACIA report projects that combined land-based Arctic ice melt will contribute a little over an inch of sea level rise over the next 60 years and nearly 3 inches by 2100. 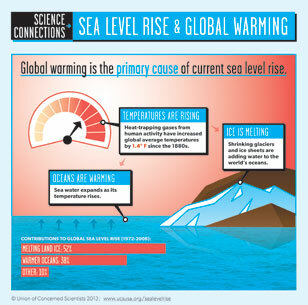 The IPCC 2001 report, based on the full range of emissions scenarios, projected an overall global sea-level rise of between 4 inches and 3 feet by the end of this century. The bulk of this sea-level rise is based on the thermal expansion of the ocean from warming. In light of the new data presented in the ACIA report, scientists will be able to better project the Arctic contribution to expected global sea-level rise. Although a couple of inches may not sound like a significant increase in sea level, consider that low-lying coastal areas, such as parts of Louisiana or Bangladesh, are very vulnerable to every inch of sea-level rise.